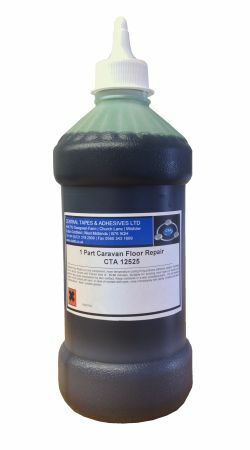 Caravan floor repair CTA 12525 has been designed for the repair of delaminated panels in caravans and motorhomes. This product can easily be injected between the panels and quickly repairs a floor or panel that has become spongy or has started to separate from the inner core. If you need to repair your caravan floor due to sponginess or delamination then this one shot product is suitable. If you have any queries, please contact us before purchase. Caravan floor repair is easy to use. Please refer to instructions for more information. The one shot Caravan floor repair product has been designed specifically for application by injecting straight into the pre-drilled holes. It will flow readily to fill the void or gap into which it has been injected. Drill small holes through from the back of the panel to the “bubbles”. Ensure the hole does not protrude through the panel, if so, tape up holes and joints to avoid seepage. It can easily be injected into the panel. Once application is completed the panel needs to be clamped or pressed for several hours to ensure that a full cure and a flat surface is achieved. Please refer to our technical data sheet for more information on our Caravan floor repair. Feel free to contact us, we are here to help you. Polyurethane MS Polymers Silicone. permalink.